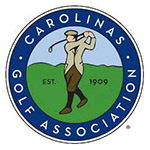 SOUTHERN PINES, N.C. (Dec. 7, 2018) – David Kelley and Dale Bouguennec prevailed Thursday in in the Carolinas Golf Association’s Senior Four-Ball One-Day Tournament of Champions. The duo from Pinehurst, N.C., went 5 under at the event at Pine Needles and Mid Pines. Kelley and Bouguennec combined for a 2-over 73 at Pine Needles, then dove to 7-under 65 at Mid Pines. That left them two shots ahead of two pairs at 3 under for the tournament. That group included David Boaz and Stan Goodson, and Doug Owens and Charlie Parks. Boaz and Goodson had fired a first-round 69 that gave them the initial lead. Kelley and Bouguennec just outpaced them over the final 18. The overall net winners in the event were Joe Davis of Gastonia, N.C., and Joel Campanella of Huntersville, N.C. That pair combined for rounds of 66-65 to win by four. Tournament format is 36 holes of flighted four-ball stroke play, gross and net scores. According to USGA handicap procedures, 90 percent of a player's course handicap is used to determine net scores. Must be a CGA member.